The Jewish Socialists’ Group (JSG) is completely opposed to all manifestations of antisemitism. Our group’s founders cut their political teeth in struggles on the streets against antisemitism, fascism and poverty in the 1930s, and we continue to expose and oppose it in all its forms. The Jewish Socialists’ Group defines antisemitism as: prejudice, hostility and discrimination against Jews, as Jews, and the use of negative stereotypes of Jews. This hostility takes various forms: physical, verbal and published. Recent reports in Britain show an alarming rise in physical attacks. We recognise that negative stereotypes have historically underpinned the most horrific hostile actions against Jews. The internet in 2017 is awash with neo-Nazi material, some of it pretending to be pro-Palestinian, alleging international Jewish conspiracies, Jewish control of the media and Jewish control of banking systems. Some sincere anti-racists wrongly regard antisemitism as a past phenomenon, marginal to today’s world, where it has been replaced by other forms of racism. But antisemitism has not been consigned to history. It is intertwined with other forms of racism and must be fought alongside them. It remains central to the ideology of neo-fascist groups in various countries, even where other ethnic/religious groups such as Muslims, African-Caribbeans, East Europeans or Roma are more frequent targets of racist and fascist hostility. A coalition of forces, under the umbrella of the International Holocaust Remembrance Alliance (IHRA), has adopted a new definition of antisemitism. 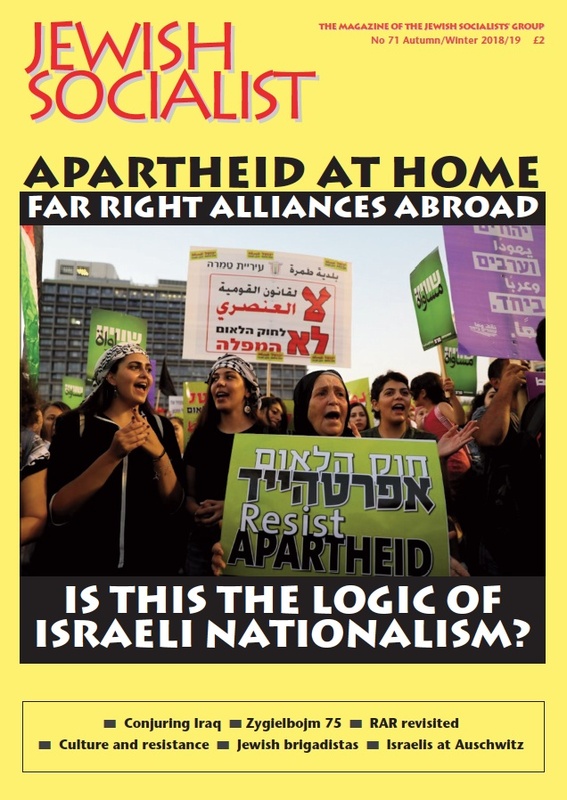 Its basic definition is uncontentious, but the document within which it has been published, deliberately employs a host of controversial and highly contested examples relating to the Israel/Palestine conflict and Zionism as an ideology. Its 11 examples of forms of antisemitism, include seven which refer to Israel. The IHRA definition of antisemitism is being used to muzzle free speech on Israel/Palestine and on Zionism as a political ideology, which like any other political ideology can be supported or rejected and should be open to question. Antisemitism, and other forms of racism and bigotry, represent a fundamental attack on the right of equality for all in society. We stand with those working for equal societies around the world. That includes within Israel/Palestine where the Palestinian minority within the Green Line are subject to direct and indirect discrimination. Beyond the Green Line, millions of Palestinians are under a military occupation which curtails many of their fundamental rights, and they are subject to frequent violent harassment from armed Israeli settlers. We absolutely oppose any hate speech relating to the Israel/Palestine conflict but we support free expression of legitimate political opinion on this conflict, and acknowledge that within Israel itself there are a range of positions expressed both on the conflict and on Zionism. The IHRA statement has been signed by 30 countries, predominantly European, but also including three in the Americas and one in Asia – Israel itself. These 30 countries include several where antisemitic incidents are on the rise. In some, such as Austria, Poland, Greece and Hungary, politicians and leading commentators have themselves made antisemitic statements in recent years. The IHRA definition draws very heavily on an earlier definition adopted by the European Monitoring Centre on Racism and Xenophobia (EUMC) in 2005. This was dropped by the European Union Fundamental Rights Agency in 2013 precisely because of the way it stretched and twisted that definition to include various legitimate forms of criticism of Israel and opposition to Zionism. We consider the IHRA definition/statement to be potentially dangerous for Jews. If opposition to Israeli policy and state action can be defined as “antisemitic” in such a manipulative way, then those who rightly continue to stand up for Palestinian rights might start to doubt the credibility of the label “antisemite”. Actions targeting the Israeli state may spread to more general Jewish targets, and genuinely antisemitic statements and actions may be taken less seriously. The International Holocaust Remembrance Alliance is using its name as a shield to defend Israel and Zionism from perfectly legitimate censure. We worry that this will also engender attitudes of cynicism towards Holocaust remembrance. The processes of scapegoating, discrimination, exclusion, and dehumanisation that led to the Holocaust are present in many societies today, including our own. It is partly through learning about and remembering the Holocaust, and recognising what led to it, that people will be motivated and mobilised to challenge such processes today. We reject the IHRA’s politically skewed definition/statement on antisemitism. We encourage any public bodies asked to adopt it to recognise the importance of challenging antisemitism today but to reject this definition. We urge them instead to adopt a simpler, clearer and more accurate definition to support their work opposing antisemitism and other forms of racism, such as the one we provide at the beginning of this statement, and to turn those words into action.